One Moment addresses one of our worst fears, the fear that we find out the one we love, aren't really who they say they are. What's worse? You find out the truth after it's too late, and it's up to only you to find all the answers and piece them together. 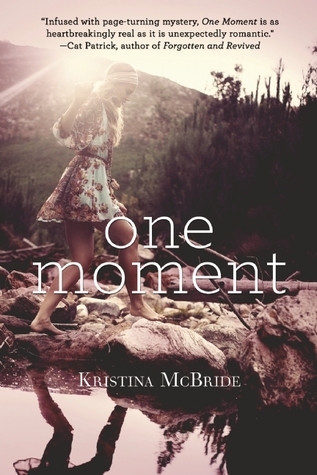 One Moment is the first book by Kristina McBride that I've had the privilege of reading, but I can tell you that it won't be my last. I absolutely fell in love not only with her delicate writing style, but with the beautiful character cast that she crafted. McBride delivered One Moment in such a way that you simply can't stop reading. She keeps you hanging on to the very edge of your seat until you turn the last page. And once you close the book for it's last time, you mind is left spinning, reeling over the heartbreaking tale you just experience. One Moment is a character driven novel. It's this circle of friends that drive the story. Each character was a vital component to the book's entire package. I saw a lot of myself in Maggie. She is an average teenager that wears her heart on her sleeve. She not only lives and breathes for her boyfriend, Joey, she also lives for her friends. We learn before cracking the book open that something mysteriously goes wrong during Joey's cliff jump that leaves him dead. The rest of the story surrounds this tragic incident and the unfolding of deep, dark secrets that test. I loved every moment I spent reading One Moment. It takes you on a wild ride of mystery, romance and heart break. It is everything you could ask for in a book! I loved this book too!! I loved that it was about dealing with someone's flaws after they died. I mean, she was never going to be able to confront Joey about what he did and that was tough, but I liked how complicated it was. People tend to want to forget the bad stuff after a person dies, but in this book, it really wasn't possible to do completely because it was left so unfinished. Anyway, great review and I'm glad you were feeling it! Visit my Website: " entertainment and Relax "tin giai tri" hot"
Do you want to watch chon tuoi xong nha or xem boi tu vi 2018? You are the person who loves to experience new things. Please visit my website online games for girls and best point and click adventure games online. Hope you enjoy it. You can see Jimmy kimmel back to the future very funny.